First and foremost, congratulations for being elected as School Superintendent for Leon County. You have already shown parents and students within Leon County that you are a man of integrity! During the campaign season, you could have easily counterattacked your opponent, Jackie Pons, when he ran the negative T.V. ad attacking your parenting skills. But you, Mr. Hanna, chose to do what First Lady Michelle Obama has repeatedly told us all to do, “When they go low, we go high!” Thank you for going high! Mr. Hanna, as you may know, United States senators in Washington, D.C. are working to reform the United States Criminal Justice System. The “School-to-Prison Pipeline,” in part, spinning from public schools “Zero Tolerance” policies has had devastating effects on children and families all across America. The wish for many parents is for schools, law enforcement officials, and those working within local judicial circuits/districts to immediately dismantle the School-to-Prison Pipeline, and improve the lines of communication between local representatives, such as yourself, and those who elected you (and others) into office. You may also know that relationships matter. It is easy for people in authority to lose sight as to why the ‘People’ elected them into office. There is no doubt that you have a lot of work to do. A lot! Former Second Judicial Circuit State Attorney Willie Meggs and former Leon County Sheriff Larry Campbell, in addition to former Second Judicial Circuit Public Defender Nancy Daniels and many others have down trotted families through their ‘Good Ol’ Boys Network.’ You, sir, are coming into an office once filled by Jackie Pons—he has no integrity—he fitted into the ‘Good Ol’ Boy Network’ mold very well. Mr. Hanna, you were elected by citizens of Tallahassee/Leon County because the citizens have full trust in you to make the right decisions for their children when it comes to education. The majority of the citizens of Tallahassee/Leon County have no trust in Second Judicial Circuit State Attorney Jack Campbell (Democrat). Jack Campbell has been pacified all of his life by a corrupt system. 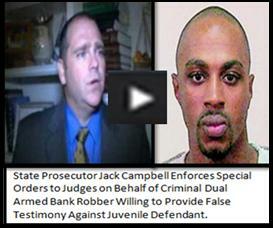 Jack Campbell does not have any integrity whatsoever! Jack Campbell has the personality traits of a child molester. And in spite of Jack Campbell being born, raised and educated in Tallahassee/Leon County—the majority of Democratic voters crossed party lines and voted for Republican candidate Pete Williams—an outsider. Now that should tell you, Mr. Hanna, that Jack Campbell is not the type of person you would want to build a relationship—unless, you plan on being some kind of role model for him. Mr. Hanna, sir, you have a lot of hard work ahead of you as Superintendent for Leon County Schools—you have to protect school children from elected pedophiles seeking to put innocent children in juveniles and adult prisons; you have to be mindful of those children whose parents are viewed by corrupt officials as being more valuable in Florida’s Prison System than at home raising their children. You have a lot of work, sir. Please do not let those who voted you into office down.